Posted by Eddie & filed under Military/Aircraft, Mountains & hills, April 29 2010. On Sunday last weekend I walked to Glen Affric from Glen Shiel (see my blog post ‘Glen Shiel’) . 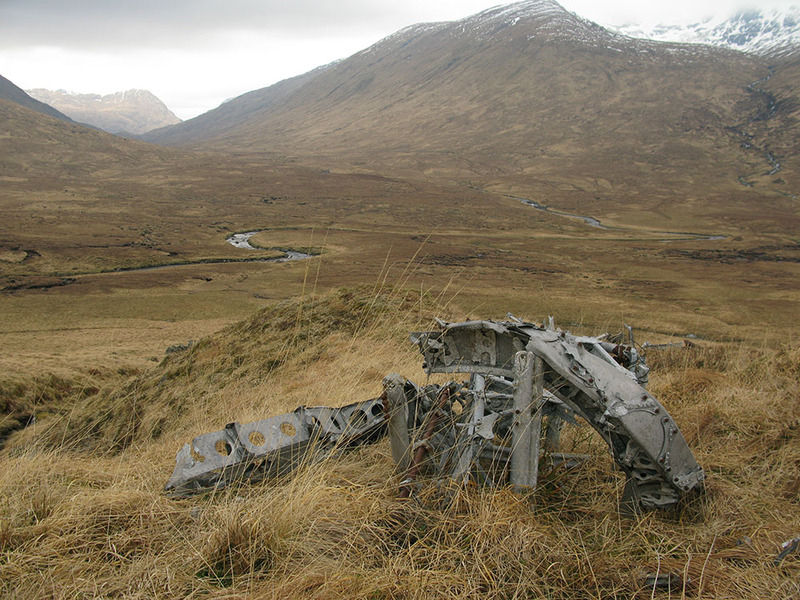 About 9km from Glen Shiel, not far from the Alltbeithe hostel, on the north-western slopes of the Munro summit of Mullach Fraoch-choire lies the site of an RAF Wellington bomber that crashed in the Glen in 1942. The location of the site is in a particularly magnificent setting, surrounded by the bleak moorland of upper Glen Affric and steep-sided mountains. Wreckage sites from crashed Wellingtons are suprisingly widespread throughout the Scottish mountains, this is the 6th I’ve visited. 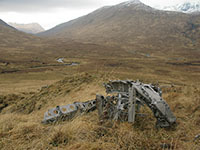 There is a substantial amount of wreckage at the site, located in a small area, and the remaining wreckage is highly fragmented, indicating a high-speed impact, although all the Wellington crew survived the crash, having bailed out before the aircraft hit the ground. Parts from one of engines (engine block, cylinders, propellor reduction gear) are still recognisable, as well as a propeller blade and parts of the geodetic frame of the Wellington fuselage. You can see my page about this site on my website here. Your website (http://www.edwardboyle.com/wreck33.html) seems to have some malware. No idea what it is but it triggered my anti virus software. Avast free version. Thanks for the wellington grid refs, I intend to be in Glen Affric in a few weeks and may try to pass by. Re. messages above – I did some more digging around and discovered that Avast HAD actually found something, but it was well hidden, in this case not in the website itself but in standard error message files on the webserver. Now fixed (hopefully), thanks for pointing this out James.